The Autel is different from the mobile phone apps we looked at earlier. 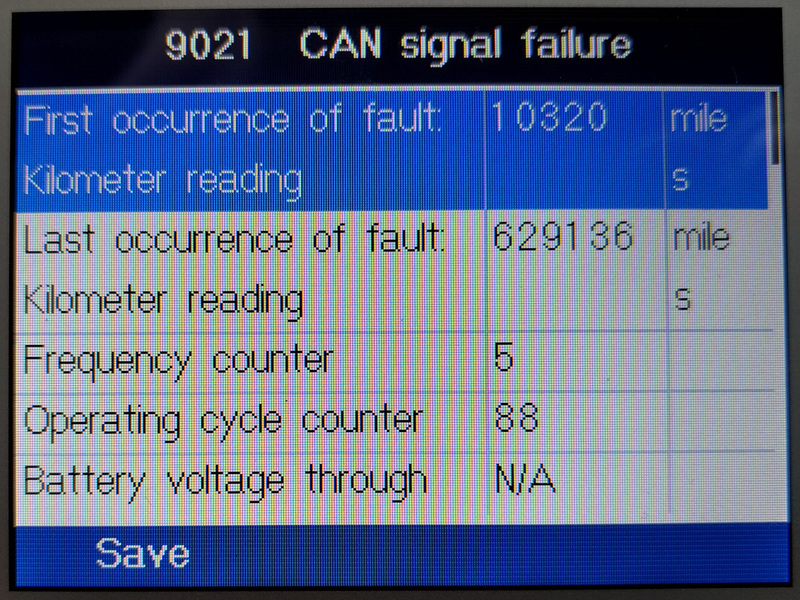 It seems to be able to read more of the van’s internal modules for diagnostic purposes. 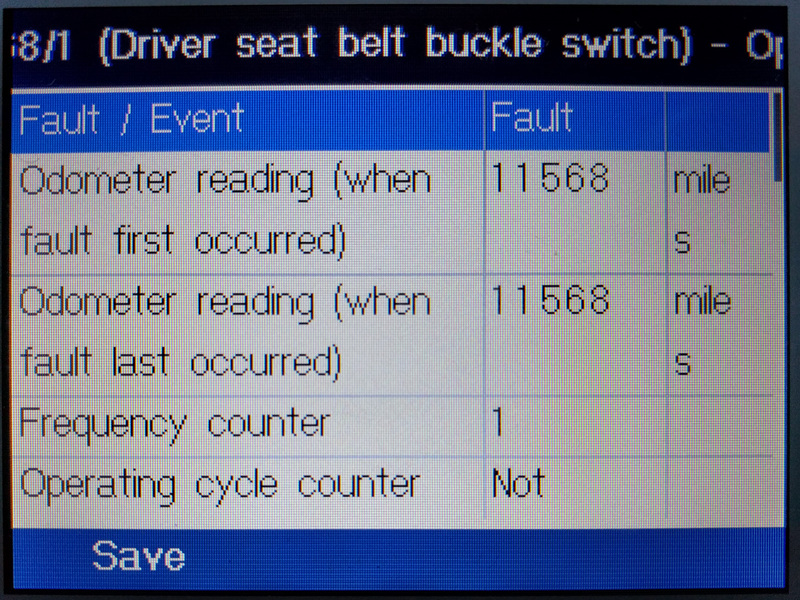 It’s not as good at showing real-time driving stats, though. 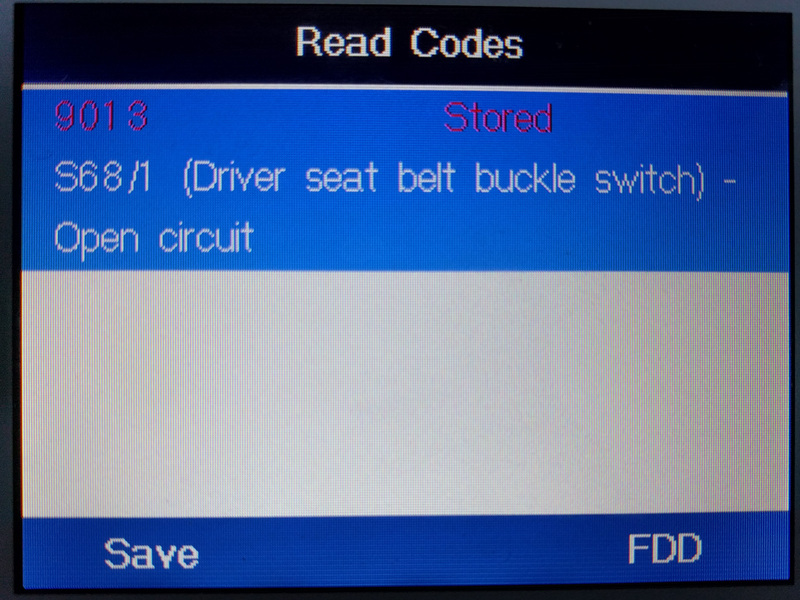 Warning: A code reading device is unlikely to mess up your vehicle, but it can only show you the trouble codes it’s able to read and then optionally erase those codes; it doesn’t “fix” any underlying issues. It might not be reading every code. Deleting codes from the vehicle might make it harder for professional mechanics to diagnose and fix any issues. Be sure you know what you’re doing before you buy and use a diagnostic tool. The MSRP of this device is around $350 but Amazon is your friend. We found pricing around half of MSRP. Make sure you get the Elite version, also known as “All system.” There is also a “4 system” version which has fewer functions, but the pricing is so screwy that often the “All system” version is cheaper so you can’t go on price alone. There’s not really much to say about the unit itself. It’s portable, but too big to fit in a pocket. 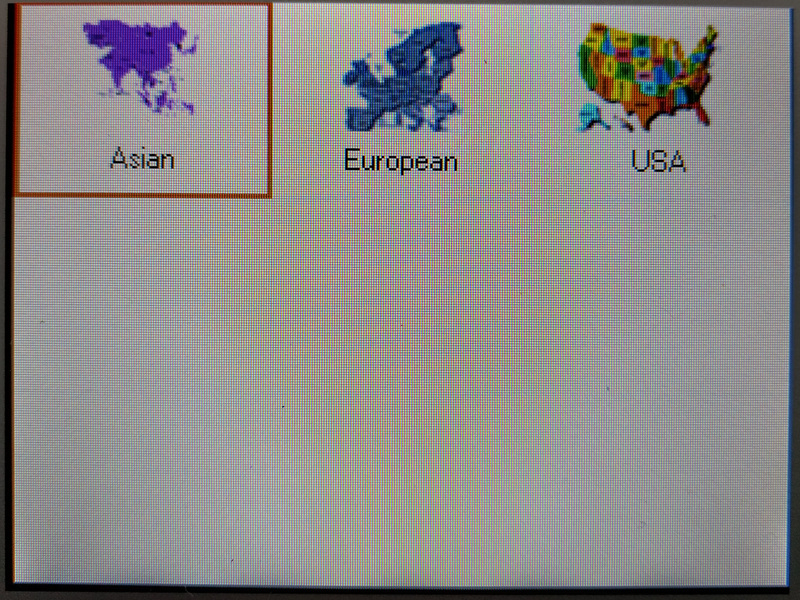 The color screen isn’t super-high resolution but it’s plenty clear enough for the type of information being displayed. The unit feels pretty rugged, like it would survive in a toolbox. It’s probably not waterproof, given the cable and SD card entry points, but the button area is a sealed membrane. 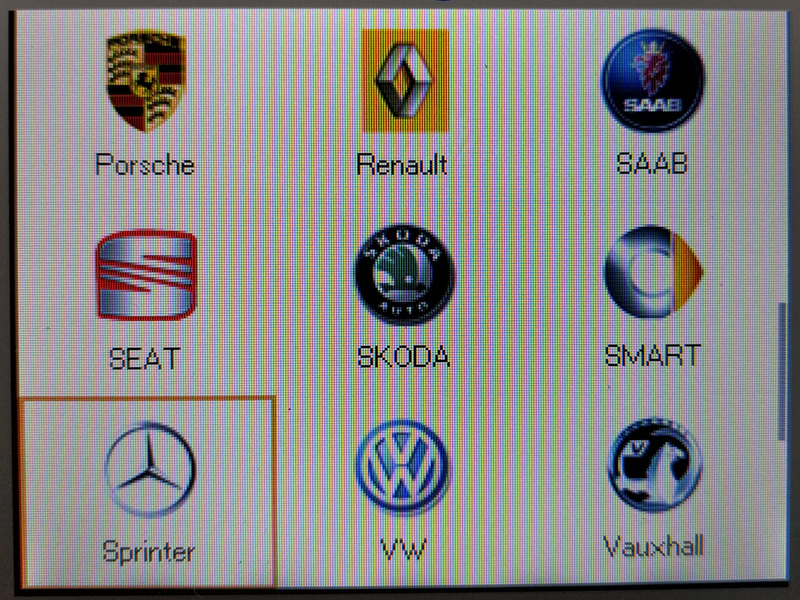 When you first get the unit, you may need to update it to get the latest version of the diagnostic software. However, before you do this, take a copy of the SD card. Updates can apparently remove or change functionality as much as they add it. You may not need to update. Try the tool first then do the update if it doesn’t seem to work for the functions you need on the model year van you have. To do an update, you’ll need to create an account online (create a user name and password), and register your device online (serial number and password from the device itself, not your account password). You have to register the tool online before you can get updates, but you can’t update from the web. However, you can’t just download device updates from the web. You have to install the update software that comes on the CD. It’s Windows-only. Our household is Mac-only. We couldn’t get the Windows software to read the card when we used VirtualBox, but we did get it running using WINE (see the appendix below). It used to be that once you’ve registered, you only get one year’s free updates. That made it worth seeing whether the tool works for your needs before you register, so that you have a longer update period available to you. Now though, Autel has announced that updates for the 802 will be free. That could be good, or it could mean that the tool is approaching end-of-life. Hard to tell. The initial screen. This is the “Elite” model, with six menu options. 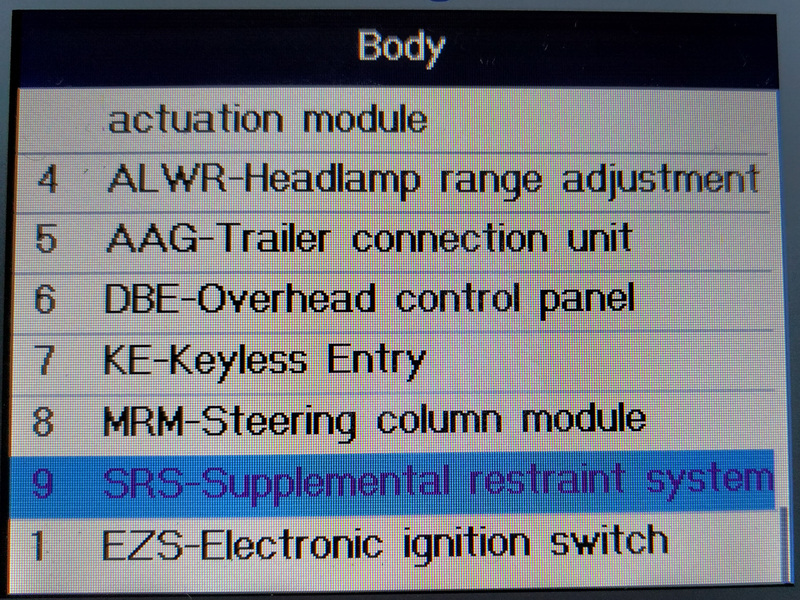 The “4-system” model doesn’t have the electronic handbrake or oil reset options. 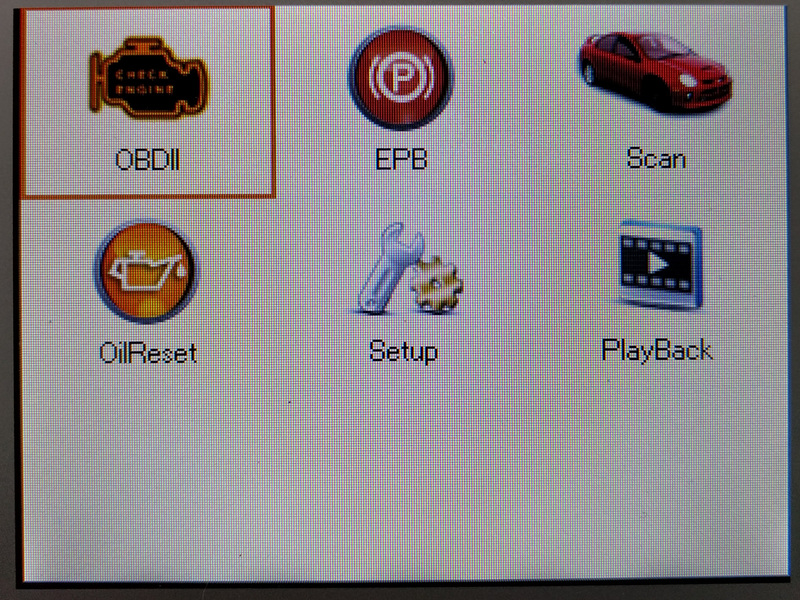 Now you have the choice of running a generic OBDII scan (top left option) or a vehicle-specific scan (top right option). 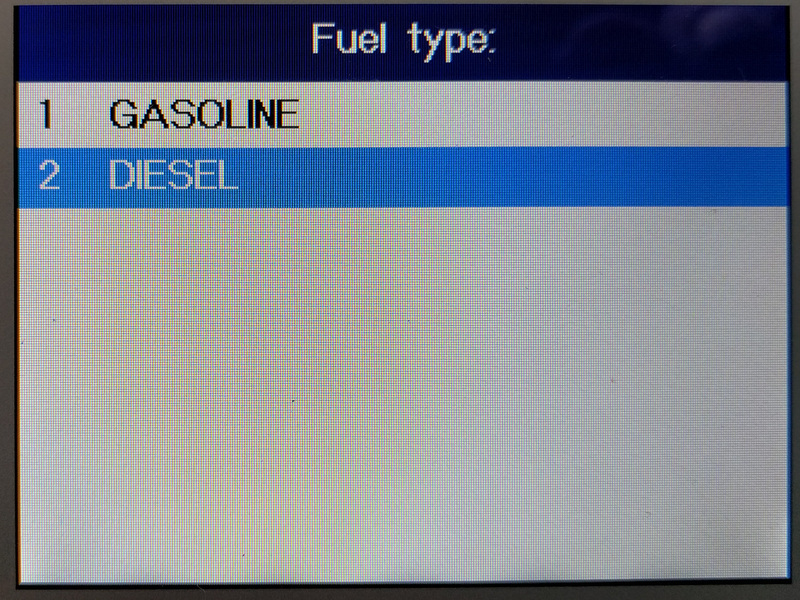 For some manufacturer’s vehicles the scanner will apparently automatically read the VIN and give you an appropriate menu choice. That’s not the case with most Sprinters though. Confusingly, this is the manufacturer region, not where you live. 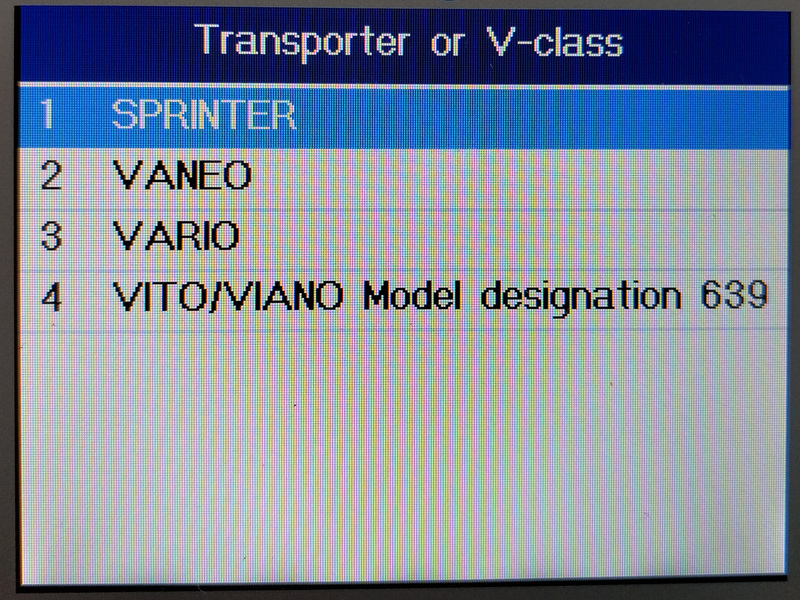 Newer NCV3 Sprinters are a separate model, under a European>Sprinter listing, separate from other European>Mercedes vehicles. 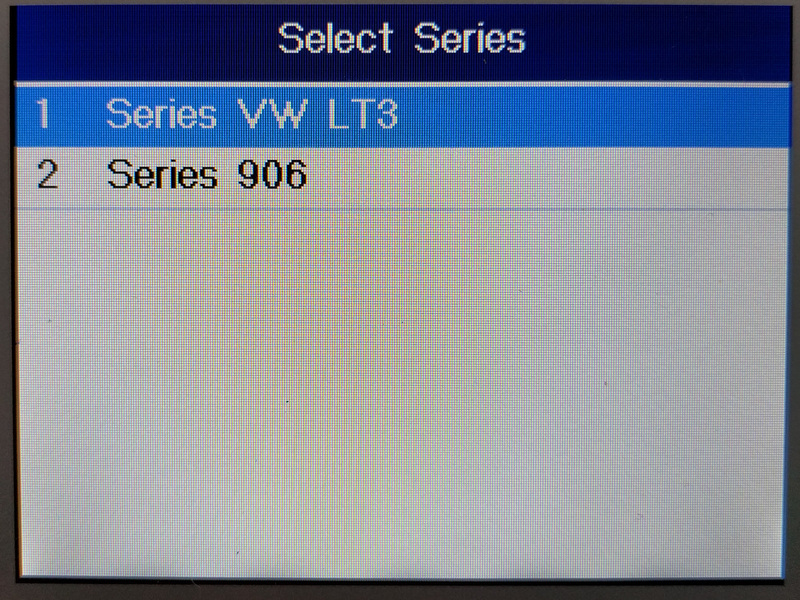 If you can’t find the subsystem you want to diagnose in this menu, try the USA>Chrysler>Sprinter option. 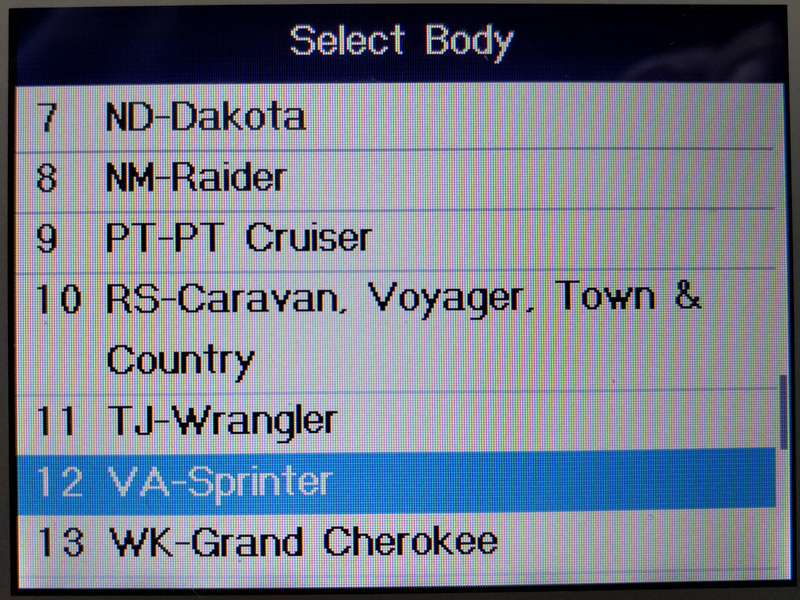 Older (Dodge branded) NCV3 Sprinters are listed under USA>Chrysler>Sprinter. 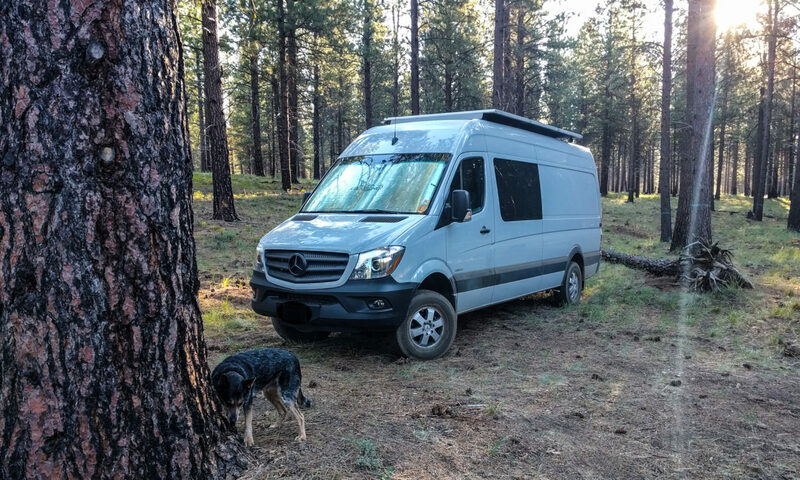 T1Ns are listed under USA>Chrysler>Sprinter. 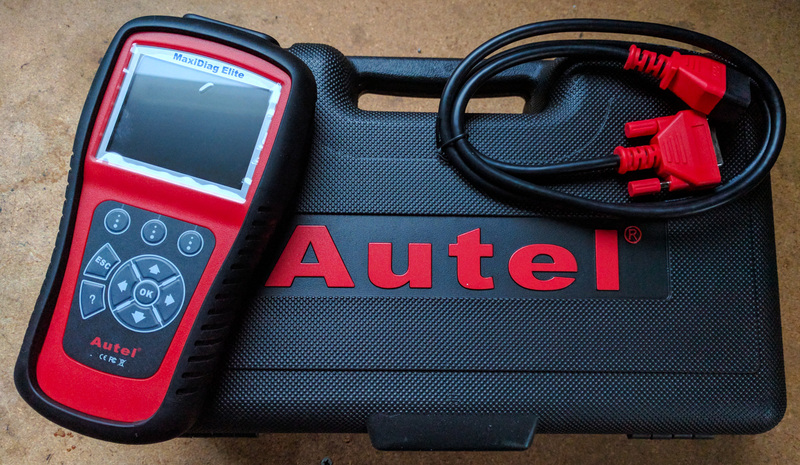 Before you start, just be aware that the Autel might not be able to read all the parameters on your van if it’s brand new. Autel focuses their attention on vehicles that are out of manufacturer warranty, so your 2010 vehicle might be fine, but this year’s model probably not. That’s not to say that the tool isn’t worth having for newer vehicles, but we did find it won’t read some of the systems that we have on our 2015 even with the mid-2016 Autel updates. Don’t choose Mercedes or Benz. Choose Sprinter. 2007+ NCV3 Sprinters are “906” models. Pre-2006 are normally option 2 in this menu. The VW Crafter is built on the same platform. Here you choose Series 906 again. Once you get to this point, you can do an automatic scan or go directly into the vehicle’s systems. 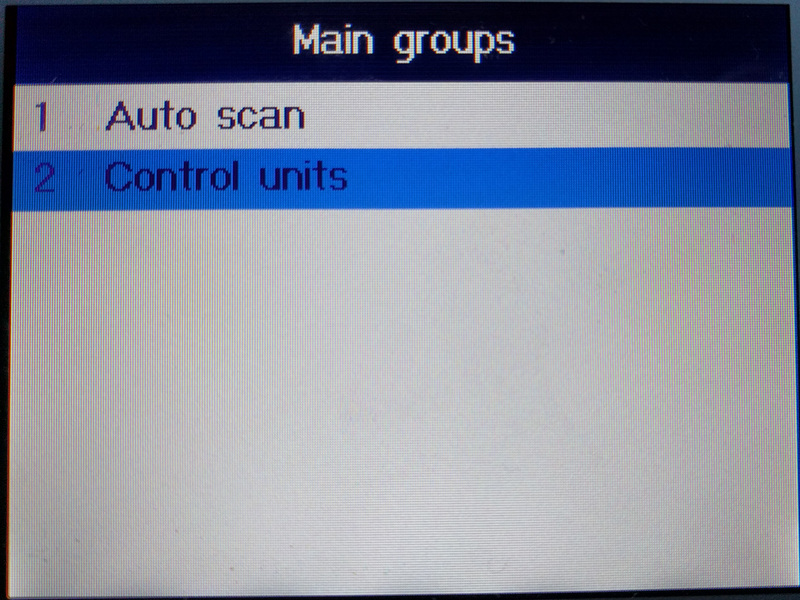 The automatic scan takes several minutes and does its best to read from each of the vehicle’s control units. You can either use the menu system above, or you can also try your luck with the Dodge/Chrysler menu option. This is under the USA area. Choose USA, then Chrysler as the manufacturer for older Sprinters. 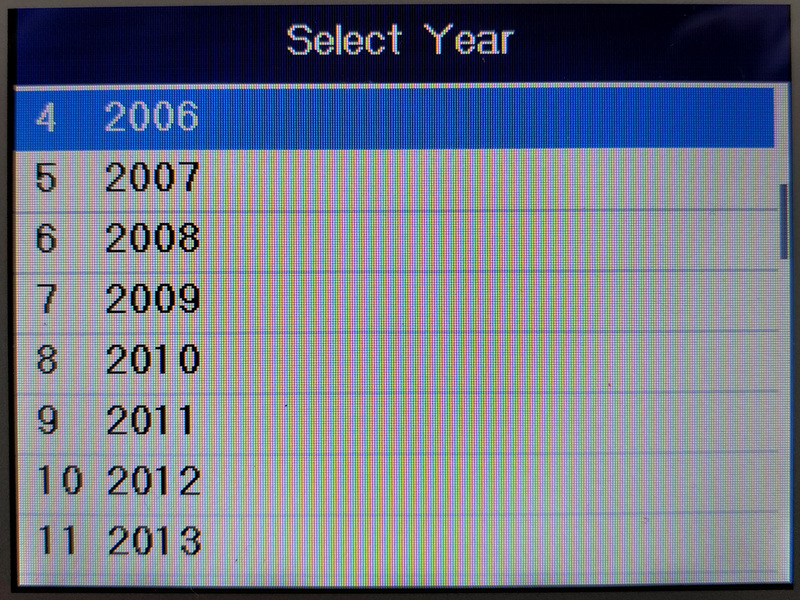 Then, select your year. Once you’ve told the tool what car it’s plugged in to, you’re ready to start diagnosing. The scanner has several functions. You can scan for current codes and learn a little about what they mean. You can also plot engine stats in real time. 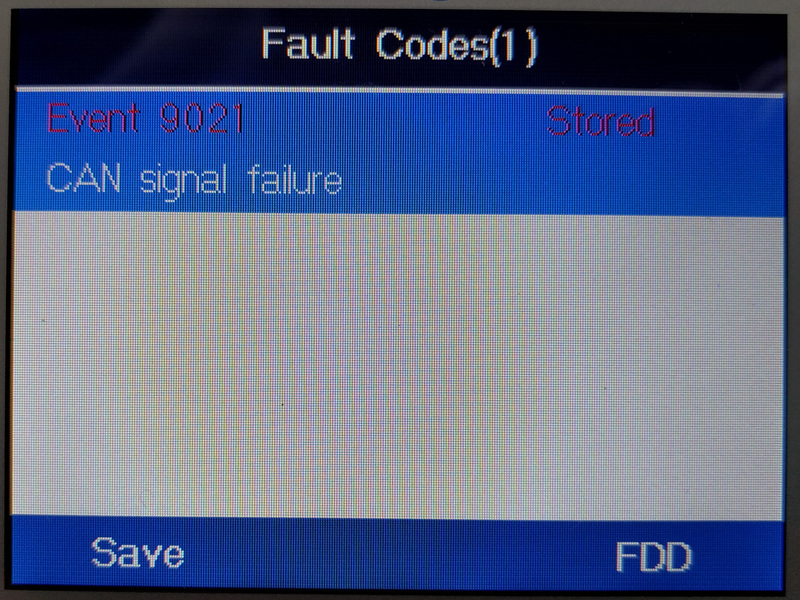 Now, several of the mobile phone OBDII apps will do this too, but they often can’t reach some of the engine components that this scanner can. Specifically, with this scanner you can reset errors in the ABS and SRS modules. Here’s the details on that error (press the FDD option). There’s also an option to reset codes. From here, just press ESC a couple of times to get to the relevant reset menu. Along with the Sprinter-specific modules, you can also pull codes from the vehicle. 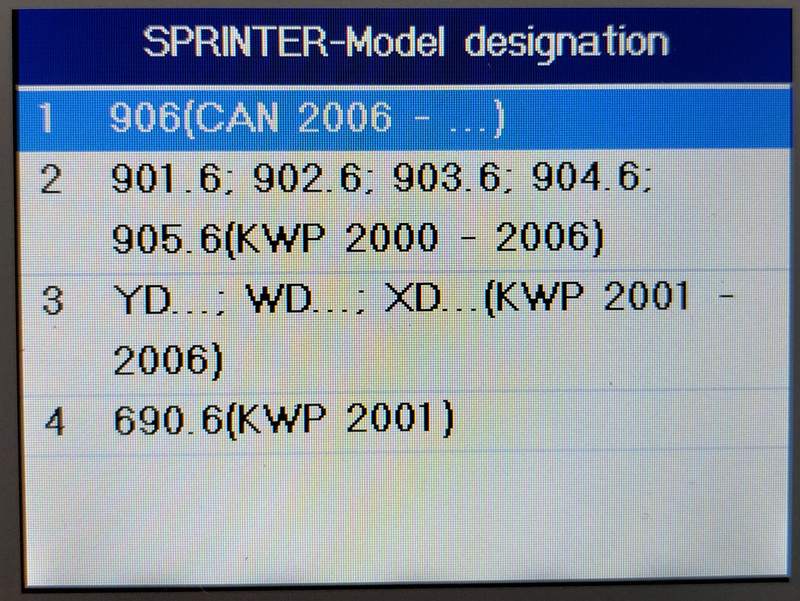 These are the regular OBDII generic codes and also the Sprinter-specific ones. Turn the ignition key to position 2 before you start. Then the tool performs a scan and shows which codes are active. 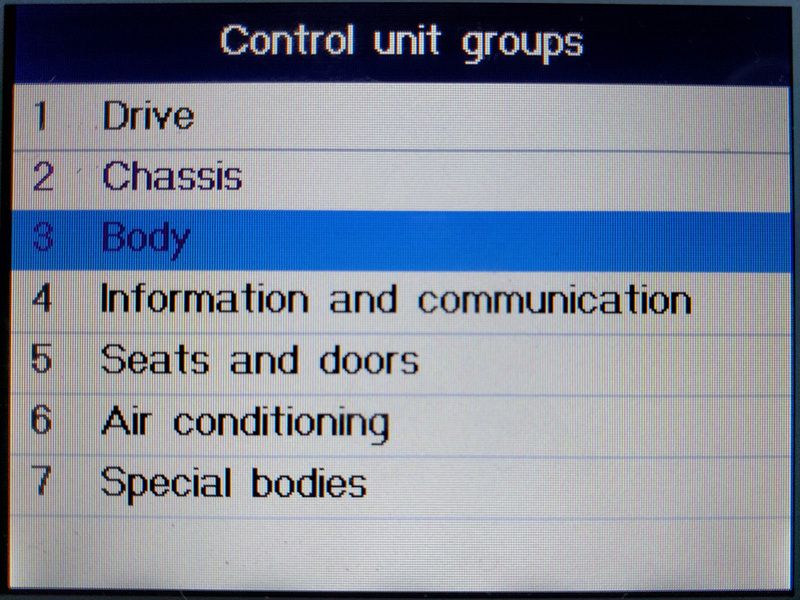 It can also provide brief descriptions of most codes, although it’s not so good on the Sprinter-specific ones. 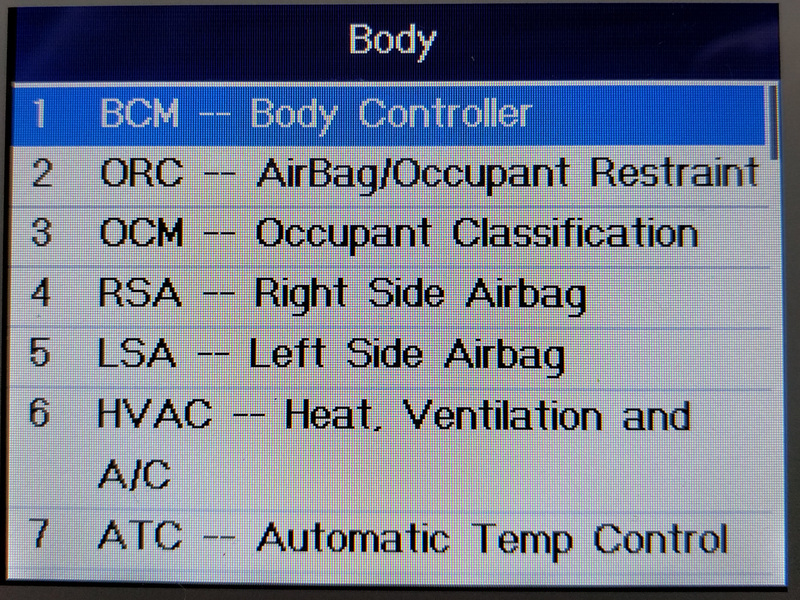 Along with the automatic scan, you can also get information on specific control modules. 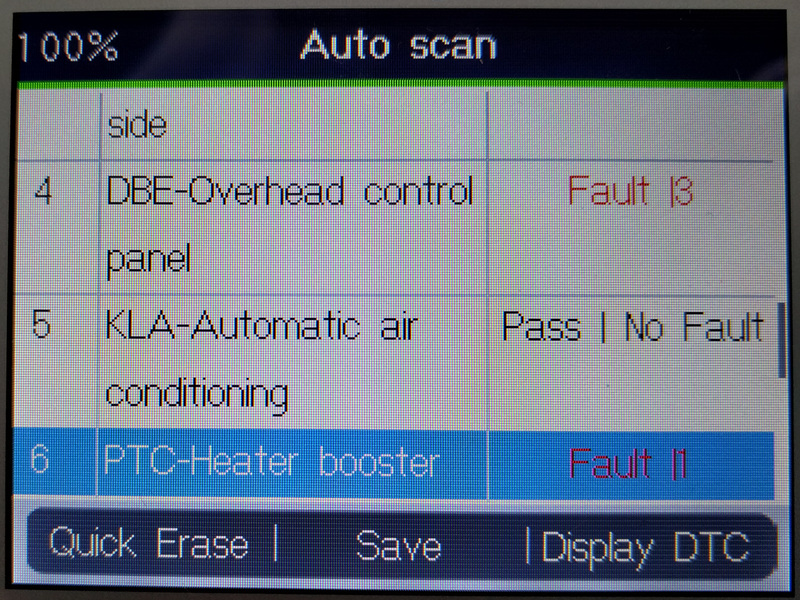 Not as many as in the vehicle-specific diagnostics, but the main ones. 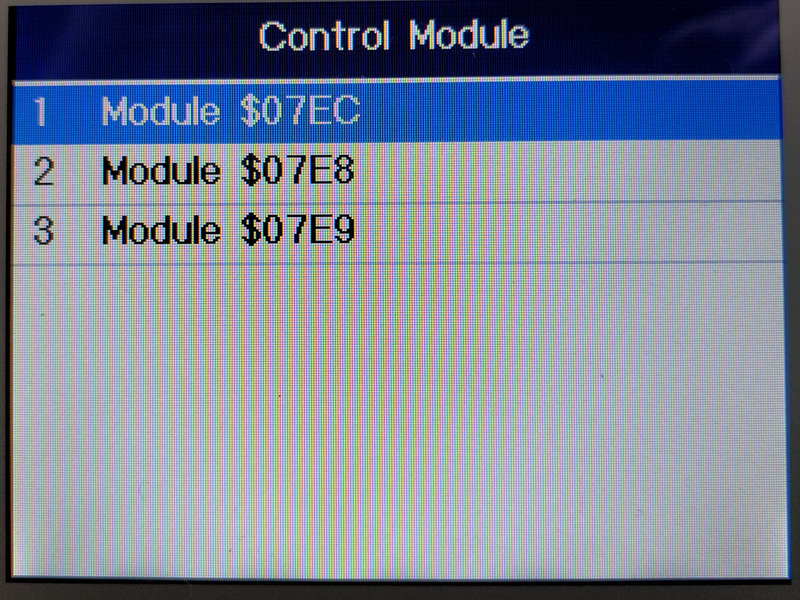 On our vehicle, module $07EC is the engine control module (ECM), $07E8 is transmission control (TCM), and $07E9 is emissions related (ECCI). 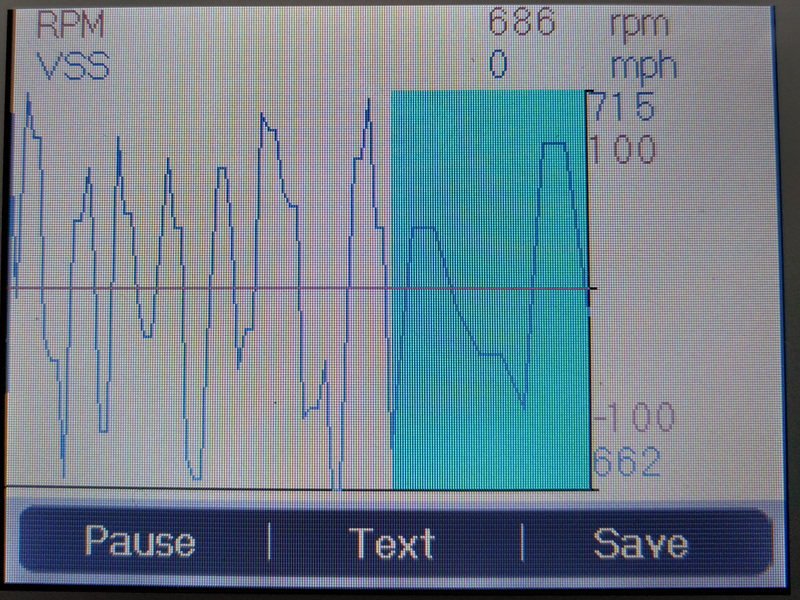 The tool can display a graph of many different engine stats. It can either show a single graph on the screen, two at a time (one above the other) or a merged graphic showing two sets of data on one graph. Saving the graph data allows you to “print” it later. To do that you have to connect the device to a PC using the USB cable, then an app (on the software installation CD) called Autel Print pulls the information off the device and displays it on-screen. It’s a horrible, slow, buggy way of doing things but it kinda-sorta works. If the Autel MD802 doesn’t do what you want, then you probably need a tool of the caliber that professional shops use. Autel make one for around $1.25k, Snap-on make one for around $15k, and Mercedes makes their own for around $30k. Or, you can go online and find a clone of the Mercedes STAR/XENTRY system for around $600. Check out eBay or go directly to aliexpress.com. Folks with vehicles up to MY2013 can use a C3 multiplexer (marginally cheaper). MY2014+ needs the C4 multiplexer. For the $600 you also get a crappy Dell laptop which is one of the few devices the software will run on. With this STAR clone, you can do things like turn on the cornering lights, force a DPF regen, reset the transmission learning procedure, or adapt new components you add. If that means nothing to you, you don’t need the STAR system. In fact because this is a professional level tool that people go on training courses to learn, you would probably end up more confused and possibly causing damage to your van. Don’t be the person asking clueless questions on the Sprinter forum. WINE is free (libre) software that lets you run Windows software on a Mac, Linux or Unix operating system. It’s NOT user friendly. If you aren’t familiar with Terminal, or with how to read/change permissions on hidden files, then don’t install it. This brief guide is all the help we’re able to give. We aren’t your support line. CrossOver is a slightly more user-friendly implementation of WINE for a reasonable price. Download “Wine Development” and try installing it. It’ll probably fail with a message about installing XQuartz. If so, download and install that. Now install Wine. Depending on how you installed it, the WINE Devel icon will either show up in your Applications launcher or in your home directory Applications folder (in Finder, click the directory that’s your username with the home icon next to it, then open the Applications folder). Double click it, and it’ll open a Terminal window. Go through the instructions in the Terminal window, specifically by typing winecfg to set things up properly. It’ll want to download the .NET framework and some other stuff too, in order to create a Windows environment on your Mac. You’ll see a bunch of errors streaming past in the Terminal window. So long as everything appears to be working, you can ignore them. Once it’s done, insert the Autel CD or download the software from Autel’s site and right click the Setup.exe file in the PC Suit directory. No, that’s not a spelling mistake. Well, it is. Autel calls it PC Suit, not PC Suite. Choose open with… and then select Wine Devel from the list. The Autel PC Suit(e) will install. Now you need to run it. It may have created shortcuts on your desktop. 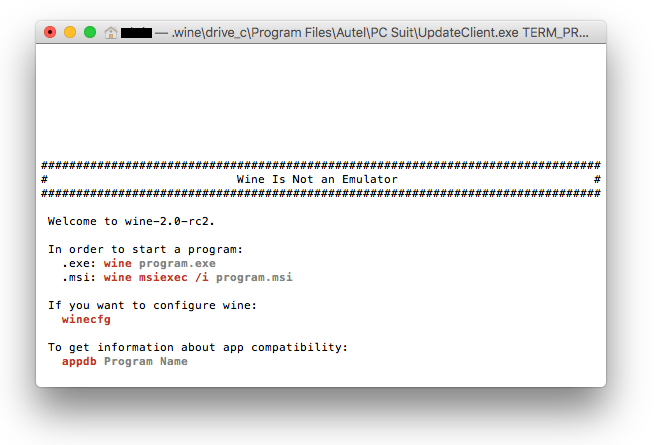 If not, from your Wine Terminal window, type wine UpdateClient.exe and it’ll run the Autel app. The splash screen will appear, then (if all went well), you’ll see a screen listing available updates. The first update it wants you to do is to the PC Suit(e) application itself. Let it do this. When it reboots it’ll get into a loop as described here where it continually tries to run the update setup rather than the new software version. (thanks SeanS for working this one out). To do as SeanS says in the post, you need to be able to “see” the directory where all this crap is stored in its faux Windows environment. That’s in a folder called ‘.wine’ under your home directory. The dot on the front makes it invisible. In Finder, do [Shift]+[Command]+G to bring up a “go to” dialog. Type in ~/.wine/ and it’ll let you into the secret invisible folder. Navigate to ~/.wine/drive_c/Program Files/Autel/Update Files and copy/move the setup.exe file from there to somewhere more sensible (desktop for instance). Now, in your Wine Terminal window, type wine uninstaller to bring up the WINE equivalent of the Add/Remove Programs Control Panel in a Windows install. Uninstall the Autel application. Next, re-install the Autel PC Suit(e) using the setup.exe file you copied to your desktop. Right click it, choose open with… and then select Wine Devel from the list. This should all look very familiar to you right now. Once it’s installed, run it again. If it created shortcuts on your desktop, use the Autel Update link. Otherwise, from your Wine Terminal window, type wine UpdateClient.exe to start it. Do NOT attach the Autel unit to your Mac with the USB cable. That works for the Autel Printer application, but not for the Autel Update application. Instead, remove the SD card from the Autel unit and insert it into your Mac. Either the built-in SD card slot if you have one, or using a USB card reader. The application should recognize the card. You might have to change drives using the drop-down list on the right hand side of the app window. My built-in SD slot was drive G:. 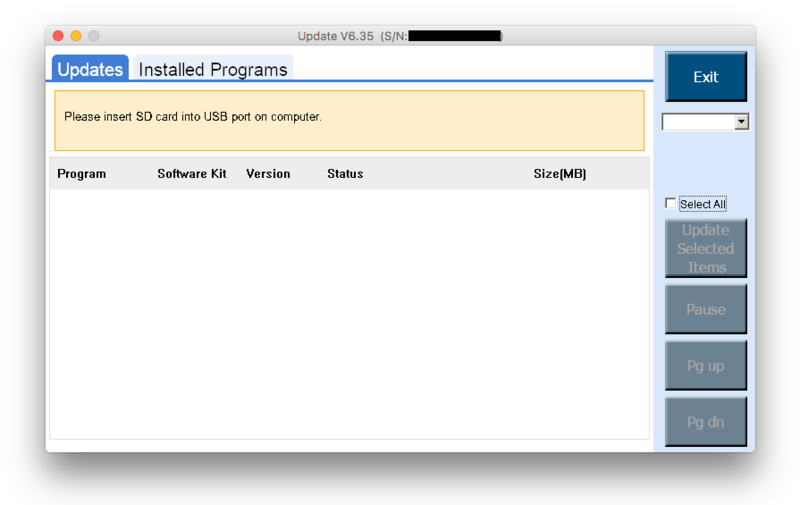 Once you get it right, it’ll think for a while and then present you with a list of available updates to the card. Select the ones you want (or all of them) and then let them install. The install process can take some time if you are doing a full update.